Situated along the Riviera dei Ciclopi together with other towns not generally popular amongst the tourists. Facing the pristine Ionian Sea, Acireale is a wondrous place to spend a holiday. Strangely enough, in spite of its baroque beauties, a great bustling market, thermal baths and much more Acireale does not receive many tourists throughout the year. It is also conveniently located halfway between Catania and Taormina. As other towns on the Ionian Sea, the 17th earthquake badly damaged it, but the wealthy people in the town were determined to rebuild it and Acireale adopted the baroque style that spread in Europe at the time. 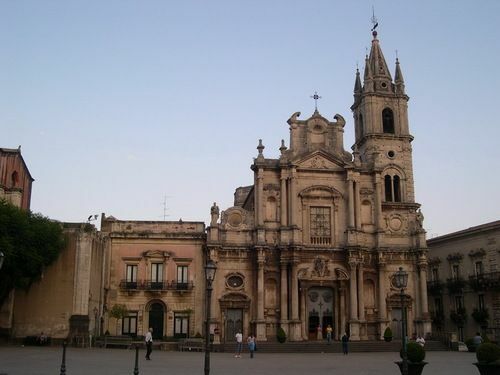 Piazza Duomo is the centre of Acireale from which to set off on an architectural discovery! The cathedral set in the piazza has been well restored and has lofty spires rising high above the town. Pietro Paolo Vasta was commissioned to create the internal frescoes. To the east of the square is the Basilica dei Santi Pietri e Paolo and its neighbouring town hall, a building that will be sure to catch your attention. Via Ruggero Settimo is a main road which leads south to the magnificent baroque Basilica di San Sebastiano. Its altar is a captivating piece and the frescoes in the dome were made by Pietro Paolo Vasta. Another sight not to be missed is the Chiesa de San Domenico, and its fish market where you can browse and buy with ease without being jostled by the hordes of customers that you may find in big towns. For both adults and children who enjoy a good puppet show the Teatro dell’Opera dei Pupi (Via Alessi) is a good option for a Sunday. The show is at 6 pm and a few other days during the week (find out in town). The theatre also houses an interesting museum. 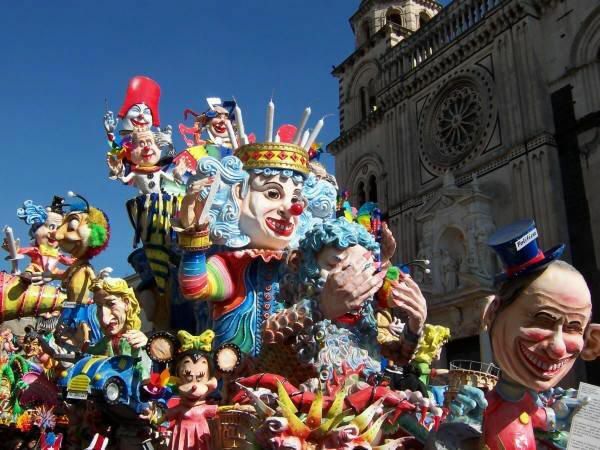 The town shows its best side and the most festive atmosphere during Lent when carnivals reach every corner spreading a festive mood. The Made in Sicily jazz festival held in September gathers Italian and international fans. The tourist information office has resourceful personnel. It is set near Piazza Duomo. (tel. 095 89 52 49; Via Romeo 1). Being on the coast means that the town benefits from restaurants serving lots of fresh fish dishes. L’Oste Oscuro’s fare includes fish and pasta topped off with excellent desserts. From here diners can enjoy the view of the beautiful baroque Basilica di San Sebastiano (tel. 095 763 4001; Piazza Lionardo Vigo 5/6). La Taverna (Piazza Marconi) is a popular choice amongst locals, located in the fish market and serving a wide selection of fish bought there. La Casa del Grecale (www.lacasadelgrecale.it) is located in a villa dating back to the 1700s. Another perfect view of the landscape from its hilltop position. The lemon trees all around also add to the charming atmosphere. BY BUS: there are buses connecting Catania and Messina that call at Acireale (Corso Umberto at the public gardens), Aci Trezza and Aci Castello.